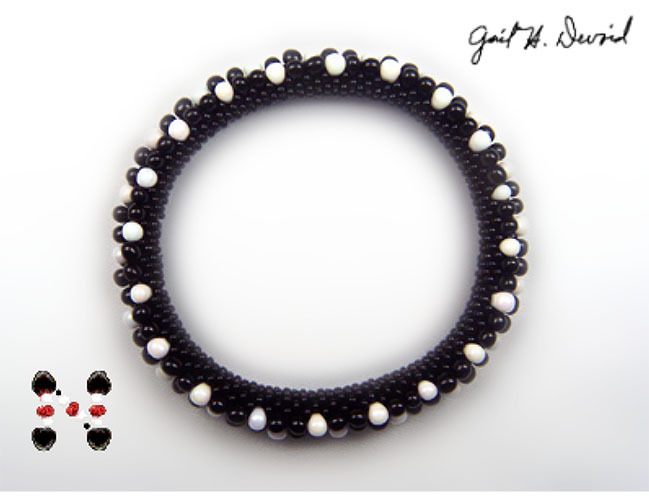 This bead crochet pattern uses 3mm Miyuki drops in black and white and 11/0 Czech seed beads. This bracelet is done with slip-stitch bead crochet, and the pattern includes instructions for beginners who have a hard time starting a bead crochet tube. Pattern includes a DB chart and detailed instructions for either an invisible join, or the completion of the bracelet with a clasp. Picture shows bracelet on its side, and the insert shows how the drops look when worn. The Czech seed beads are on the underside of the bracelet, making it very comfortable to wear. The drops are on the upper side and show the beauty of the Miyuki beads, as well as the diagonal design, when you have the bracelet on your wrist.